Dia Compe imports from Japan, a less expensive headset for their Ahead Project. This one uses ball bearings in a retainer rather than sealed cartridge bearings. The forged steel fork cone race is Chrome plated, then has the bearing surface nicely ground afterward. The lower bearing cup is made of forged aluminum, pressed inside is a forged steel race, colored Black, then the bearing surface is ground smooth. The upper bearing cup is made the same as the lower. What would be the "threaded" adjusting nut, because this is an Ahead Set, isn't threaded. 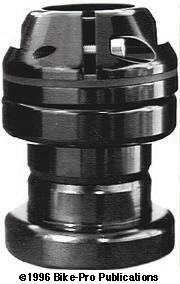 The piece is made of forged black steel with the upper cone race smoothly ground after coloring. The interior of the upper adjusting nut has a beveled taper, wide at the top, narrow at the bottom. In this beveled interior rests a similarly tapered aluminum ring, that is cut through vertically to allow it to expand. With the Ahead Stem cinched to the steerer tube, this compression ring expands to hold all the head parts firmly to the fork. 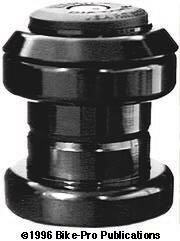 The headset has O-ring seals, upper and lower, between the cone race and the bearing retainer. The headset has twenty-four 4mm ball bearings in each steel retainer. Included is the Star Fangled Nut, which pre-loads the bearings for final adjustment, then closes off the top of the steerer tube. The SFN has a 5mm threaded bolt which draws up the SFN and holds in place the nut/plug (upper cap) assembly. The DC Ahead Set is available in Black or Silver, and made in 1", 1 1/8" or 1 1/4" diameters. The 1 1/8" diameter Dia Compe Kontak DL Ahead Set weighs 172 grams, of which 35 grams is the SFN. An all steel model of the Kontak is available. It has steel cups, compression rings and SFN. The steel model is painted Black and comes only in 1" or 1 1/8". Dia Compe makes in the United States a sealed bearing Aheadset with alloy parts that has two variations on its locking to the steerer tube of the fork. The upper and lower cup are machined from 7075-T6 aluminum rod. A precision sealed ball bearing cartridge, that uses thirty-two 1/8" diameter alloy steel balls, is pressed into each of the cups. The fit is so correct on these bearing cartridges that cup and cartridge replacement is necessary if the bearing ever wears out. The fork crown race is machined from stainless steel. Here is where the two headsets depart. The S series II is for Aheadset use. What would be the threaded adjusting nut isn't threaded. Made of machined 7075-T6 aluminum, it lays over and seats into the bearing cartridge. 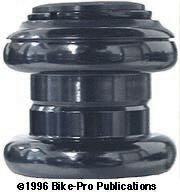 The interior of the upper adjusting nut has a beveled taper, wide at the top, narrow at the bottom. In this beveled interior rests a similarly tapered aluminum ring, that is cut through vertically to allow it to expand. With the Ahead Stem cinched to the steerer tube, this compression ring expands to hold all the head parts firmly to the fork. Included is the Star Fangled Nut, that uses a 5mm hex wrench to tighten, which pre-loads the bearings for final adjustment, then closes off the top of the fork steerer tube. The Threadhead version of this headset uses a machined 7075-T6 aluminum adjusting nut that is threaded for use with traditional, threaded steerer forks. This upper piece seats on the bearing cartridge, closing it off from outside contamination, and has an O- ring stem seal recessed into an inner lip at its top. Like a few other headsets, the Threadhead has a headset "lock" built into this upper piece. A hole is drilled and tapped horizontally at about half the height of the piece, for a small cinching bolt with a 2.5mm hex head. It is cut horizontally, half way across the piece, near its bottom. Then it's cut vertically from the top to the horizontal cut, opening up the top half. With the bolt installed, this upper head piece, when threaded on the steerer tube, is capable of being cinched more tightly around the fork tube. Notches are also cut into the top piece for a headset wrench to grip, during adjustments. All the aluminum parts of both models are anodized, either Clear to a Silver or Black. Both of these headsets are available in 1", 1 1/8" or 1 1/4" diameters. The plastic top cap pieces are available in all three diameters, in Black only 1" Plastic Cap Piece, 1 1/8" Plastic Cap Piece, 1 1/4" Plastic Cap Piece Spacers are available to raise the height of the stem on the steerer tube. They are sold in set of three in either 1" or 1 1/8" 1" spacer set, 1 1/8" spacer set In the un-likely case where you need a replacement Star Fangled Nut and internal steel tubing connectors aren't available at a nearby display store, these are available in all three sizes.